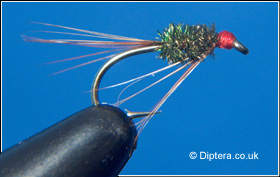 The Diawl Bach (Little Devil) is best fished on the point , but can also be used on the top or middle dropper too. Use when buzzers are on the water. It can be fished on any line, from floating to fast sinker and at almost any depth. It can be fished up and "on the hang" on a fast sinker or fished slowly on a floating line. Wind the tying thread down to a position half way down the hookshank catching in some fine copper wire and a few strands of peacock herl until you reach a position opposite the barb. Keeping the herls together and not twisting or crossing them , wind the peacock herl up towards the eye. Stopping just short of the eye. Now secure the herl. Take the fine copper wire and wind in even spaced turns towards the eye creating a rib. Secure the wire. (NB. Make sure you wind the rib in the opposite direction to that of the peacock herl). Trim the waste peacock herl and wire. Take a bunch of red game hackle fibres , measure the distance roughly diagonally from the eye to the barb and trim waste. Hold the hackle fibres under the position of the head and secure with thread, these should be in line with the hookshank. Build a neat head, whip finish and varnish.